A Combi System presents the best of both worlds and is ideal in situations where a customer has purchased a Plasma or LCD TV in the past number of years before Saorview was launched. Using a UHF aerial, a satellite dish, and this Set Top Box, all Saorview and Free to Air Satellite channels are available from one box. One remote control is all that is required to operate all functions. These boxes also have a HD output for superior picture quality. At the moment there is only one Saorview approved combi system (Triax 114). 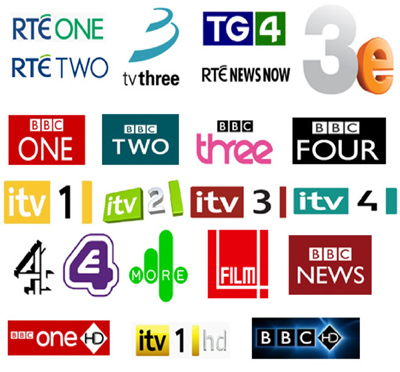 This gives you the full Saorview EPG (electronic programme guide) which shows a full 7 day TV guide, the satellite section of the combi box provides a now and next TV guide. An external HDD can be attached for recording purposes. Another Combi Set Top Box available is the Ferguson Arriva 120. It is not a Saorview approved system and does not have EPG (electronic programme guide). Combi Systems starting from €299.00 incl. vat supplied and fitted. We can tailor multiroom packages to suit your individual needs.